I am back with a fantastic hotel chair flip for my son’s teen room we have been working on adding things too this year. 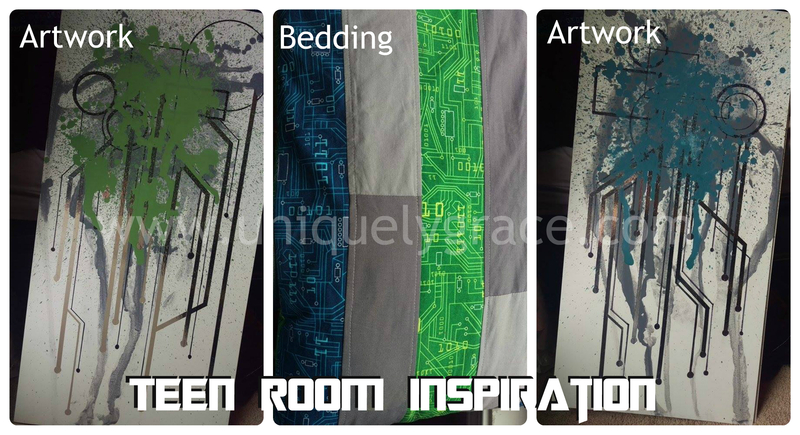 This chair project was inspired by some art work I did for his room a couple of months ago and it was encouraged into my painting schedule by The Fab Furniture Flippin’ Contest this month. The theme for September is Geometric and the sponsor is General Finishes, they have a wonderful prize pack awaiting the winner of this month’s contest. They generously gave each contestant a product to try as well. I however missed the deadline due to family distractions so alas… I missed out. Maybe I will get to try them one day, you know they have a great prize pack… wink wink. A girl can dream. 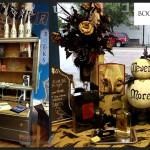 I am honored to be creating side by side with many talented furniture refinishing artist this time around and honestly they have blown my mind. 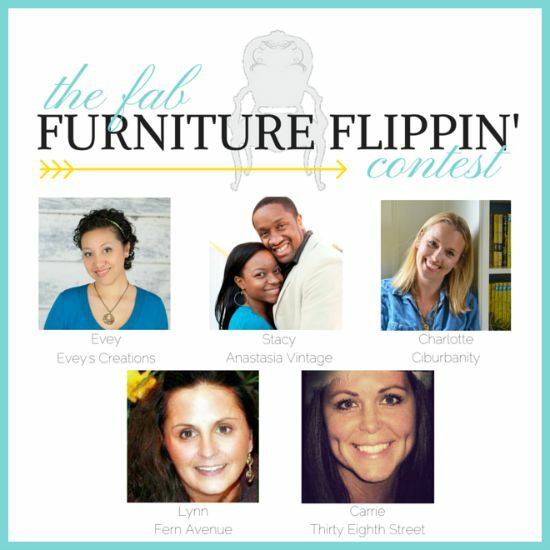 If you would like to see more of them you can check out The Fab Furniture Flippin’ Contest’s Facebook Page. Now, some of you may remember that my son just got a surprise makeover for his room over the summer. He loves every inch of it at takes good care of it now that it is all organized. Though his reveal is over I still find things to add to his space and his love for reading calls for a reading corner and chair. Blues, greens, grays, and geometric circuit board patterns. Typical Teen boy room right? I had to have every thing custom made (good thing I have a lot of talented people in my family) or make it myself to get this space to be themed circuit board/technology. He love this stuff, and he loves to embrace his inner dork, proudly! I love him for that. He had a lot of input on this project I am sharing with you today and he is very excited to get it into his room. Lets get to the project shall we? This was a free, curb side special. It is an old hotel chair. The fabric is more of a vinyl and the wood base was pretty trashed with paint, scratches and a peeling finish. But like most of us refinishers see past all that, ya know… it had good sturdy bones and that is what matters. I began by taking the cushions off of the chair and cleaning them up with vinegar and water. Sanding the surface of the wood and cleaning that too. 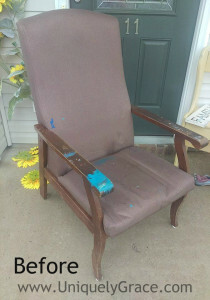 The base of the chair is painted a Licorice black and the chair cushions began with a Snow White base coat, several coats with sanding and cleaning in between. Those are needed when painting fabric (click for tutorial). After the base coats were dried I began adding the detailing. 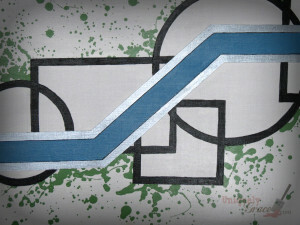 Hand painting at times and other times using painters tape to create strait lines and angles. I traced some circles by using different sized cooking pot lids and the rectangles were two different books I traced for the basic shape. Hand painted in each of the shape outlines with a black Licorice color, I used a Lillian Grey and then went over that with Stunning Silver to create the silver stripes. 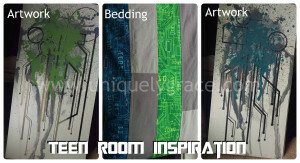 The blue and greens were custom mixed to match his bedding fabric. After letting the chair cure over night and dry I taped over all the shapes and main stripe design. Painted white around the edges to help avoid any bleeding under the tape from the watered down green chalk-acrylic paint and then splattered it all with the green paint. The humidity was not my friend this time around with the green paint a little thicker it took forever to dry! However the outcome was fantastic! Here are the full list of hosts, check out their fabulous furniture flips for this month’s Geometric theme. If you are interested in participating in this contest during future months, please contact: info@fabfurnitureflippincontest.com. 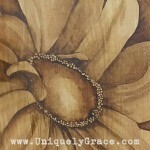 Oh Grace, I love this piece so wonderful and creative. A perfect fit for the room. That’s one lucky kid! Pinning this one for sure! Thank you so much Brenda!!! He really loves how it all is turning out. We are just about done with his space. Hi my name is Sandra and I discovered your Hotel Chair meets Chalk Paint – Fab Flippin’ Contest Geometric page.